Hey folks, back with some more news for ya. I returned from Fried Egg west coast tour last week, and let me tell you, that ruled! It was great to finally meet some of you in person, and seriously, every show ruled. Aside from driving like a madman (Portland to San Diego and back up to Vancouver!) the whole trip was wildly enjoyable, the sights were incredible, and we got to play with some amazing bands. Check Maximum Rocknroll Radio this Sunday to hear the episode Fried Egg recorded while in San Francisco and keep yer eyes peeled for a Fried Egg Beat Session cassette coming in October on Shout Recordings. As you may know, I am a native of Charlottesville, VA. On August 12, a massive "Unite the Right" event was held in protest to a statue of Robert E. Lee being removed from Lee Park in downtown Charlottesville. Thousands gathered, including Nazis, Klansmen, and those from other right wing organizations. Many of my friends were out among the thousands in protest, and sadly enough, a legitimate act of domestic terrorism was committed as a 20-year old "alt-right" supporter drove his car into a group of protesters on Charlottesville's downtown mall, killing one and injuring 19. This is not something to ignore, or casually play off as a one-time occurrence. In standing in solidarity with those in need of help in Charlottesville, I will be donating 20% of all sales until the end of August and also matching that amount personally. Stay tuned for updates on the fundraising efforts. new arrivals to the site this week, as you can see. 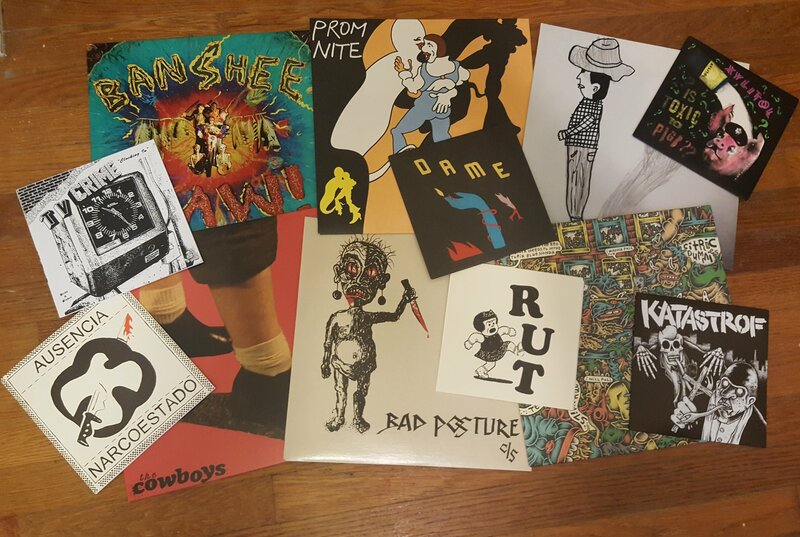 As I always strive to do, I've written reviews for every new arrival, so I'll spare you the fine print, though I'd highly recommend the COWBOYS-Vol 4 LP, RUT 7", THE COWBOY + CITRIC DUMMIES LPs, KATASTROF 7", BAD POSTURE LP reissue, and BANSHEE LP. Tons more on the way including the new ORION CS on Cool Death, ANTISEX LP, PUBLIC EYE LP, and more! Lots of new releases in production here. DIRTY & HIS FISTS 7" test presses have been approved and vinyl should be here by early September! Finalizing some artwork and aiming to have this one ready for our September update. THE LANDLORDS LP is finally, finally about ready to go off to press, as is the debut 7" from HAIRCUT, which I just posted a preview track from! Five killer HC punk tracks on this 7". Click here to listen to "Boys Club" by HAIRCUT from the "Shutting Down" 7" (FEEL IT 14). Remember - FRIED EGG and the Feel It distro will be at CROPPED OUT in Louisville, Kentucky from Sept 22-23! Fried Egg is also touring around NOT DEAD YET in Toronto come early October and I'll be posting those dates in the next update. That's about it for now, stay tuned and stay cool.